1405 Simple X Expanded (Single/Double Precision) by iamjonlawrence is licensed under the Creative Commons - Attribution - Share Alike license. An upgrade for the X axis of the 1405 model Printrbot Simple Makers edition. Expand the bearings to increase rigidity. Move the drive motor to the center to increase stability. Required minimum print area for motor mount: 80mmx147mm. Multiple BedEnd files have been uploaded for various bed screw widths. Minimum BedEnd required print area will depend on BedEnd used. Increase idler bearings to 608 size. Better match for belt width and more common world wide. Build in (2) switch mounting locations for fans and power. Built in LED receptacles to illuminate the power and fan symbols. Can be configured as either single or double precision. 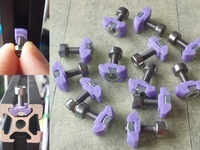 For single precision, remove bearing on BedEnd and install tension block. Double precision configuration is shown. Printrboard cannot be mounted under machine (where the X motor is now). 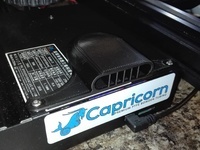 Mounting the Printrboard in a well ventilated area will help protect the stepper drivers from overheating. 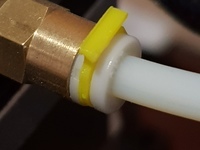 Important to note: If you are using printed plastic as structural machine parts it is important to keep them cool. I have included mounting locations for fans at the heat sources (Motors, Extruder, etc.). Care must be taken to avoid over heating. I have included a printable bed mount post if you wish to use springs. This item has a captive nut. If you are going to mount directly using heated bed mounting holes, the heat will transfer thru the screw and soften the mounting bracket. 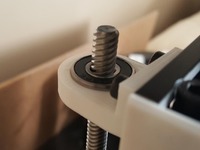 In this case I recommend clamping a 3/8" wood dowel in the BedEnd and using a wood screw to mount your heat bed to the dowel. The wood will act as a thermal insulator. In addition, some sort of insulator must be placed between the heated bed and the plastic BedEnd part. In the graphic I show a sheet of cork under the entire surface, but it is only required between the heater and the plastic. Covering the rest of the area helps to improve the efficiency of the heater. I have printed a couple iterations of this design and everything seems to come out as expected. I am designing my upgrades to the 1405 as I go, and have not yet completed the 1405 build. Concequently I have not yet run this specific design, but there isn't too much new here so I don't expect any issues. If you find something wrong or that needs improvement, please let me know. As always, feedback and suggestions are not only welcome but encouraged. LED's (if desired) They should push into the hole, than a M3 screw will hold them in place by the edge. X axis end stop cable should be routed to the center, down the slot provided over the drive pulley, and back thru the slot in the diagonal brace. A tie wrap location has been provided just above the slot over the drive pulley. This should keep them clear of the drive belt and out of the way.